Status: Rare casual winter visitor south and east. Documentation: Photograph: 29 Dec -10 Jan 1984-85 DeSoto NWR, Washington Co (Rose 1985). Taxonomy: The fabalis group of subspecies (fabalis, johanseni, and middendorffii), were formerly combined with the serrirostris group (serrirostris and rossicus) as Bean Goose (A. fabalis). The serrirostris group is now known as Tundra Bean-Goose (A. serrirostris) (Banks et al 2007) and the fabalis group as Taiga Bean-Goose (A. fabalis). Both Nebraska records are of A. f. middendorffii. Winter: An individual was found by Alan Grenon and Rick Wright with Snow Geese at Desoto NWR, Washington Co 29 Dec-10 Jan 1984-85 (Wright and Grenon 1985). A photograph was published (cited above) and many observers saw the bird, which was assignable to the subspecies middendorffii. Another observed by Stephen Dinsmore with Greater White-fronted Geese at Funk WPA, Phelps Co 4 Apr 1998 was also identified as middendorffii (Brogie 1999). 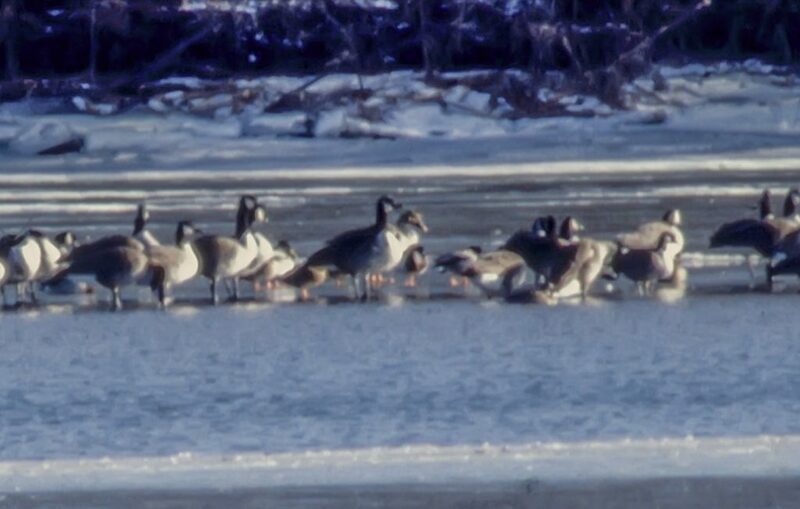 Taiga Bean-Goose (center, rear) with Canada Geese and Mallards, at De Soto National Wildlife Refuge, Washington Co, 5 Jan 1985. Photo by Phil Swanson. Comments: The eastern Siberian subspecies middendorffii is rarely kept in captivity, which supports wild origin for a straggler to Nebraska (Bray et al 1986, Howell et al 2014). Banks, R.C., R.T. Chesser, C. Cicero, J.L. Dunn, A.W. Kratter, I.J. Lovette, P.C. Rasmussen, J.V. Remsen, Jr., J.A. Rising, and D.F. Stotz. 2007. Forty-eighth supplement to the American Ornithologists’ Union check-list of North American birds. Auk 124: 1109-1115. Rose, B.J. 1985. (photograph). NBR 53: 3. Wright, R., and A.G. Grenon. 1985. Three species of Siberian Geese seen in Nebraska. NBR 53: 3-4.